Grid Iron & Stellar Quines present Bingo! 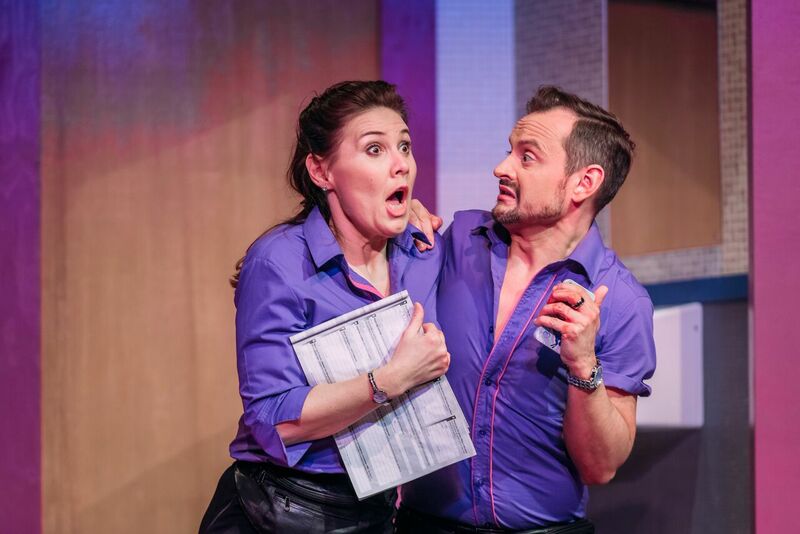 – a boisterous, bawdy Musical Comedy with a sharp bite! In the 1960s, when Variety Theatres began to close, the Bingo Halls took over as a major attraction for women of a certain age for a good night out with friends – more entertainment than pure gambling. Today, over 300 Bingo clubs across the UK entice over two million players each week – a new 1,000-seater venue recently opened in Southampton. The idea for Bingo! 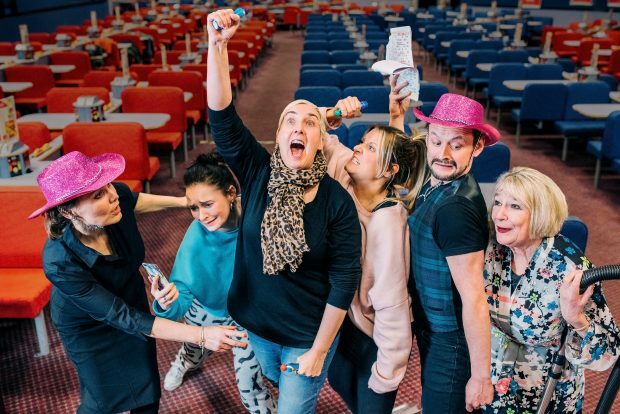 a new Musical Comedy was sparked by Jemima Levick, (Artistic Director, Stellar Quines), who was introduced to Bingo by colleagues when working at Dundee Rep. Whilst they rarely won anything she was hooked. The makings of a drama were all there – a distinct community, family & friends, all hoping that a Jackpot win will change their lives. 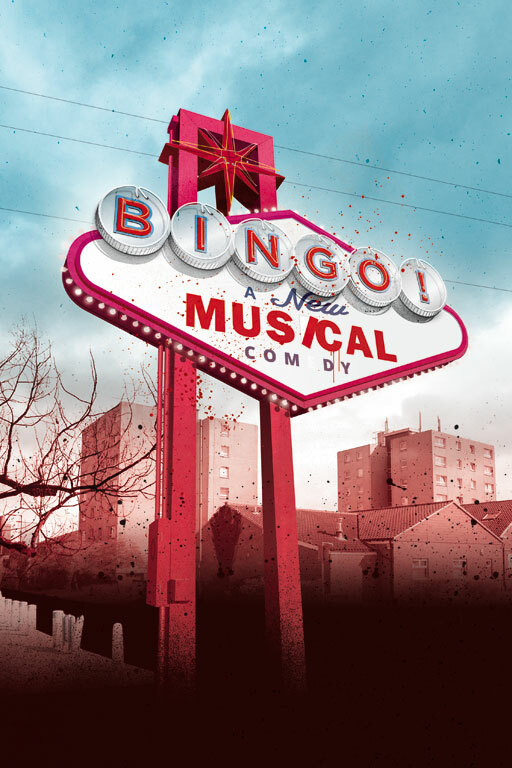 Written by Anita Vettesse & Johnny McKnight, with music by Alan Penman, Bingo! is an innovative co-production by Grid Iron and Stellar Quines. 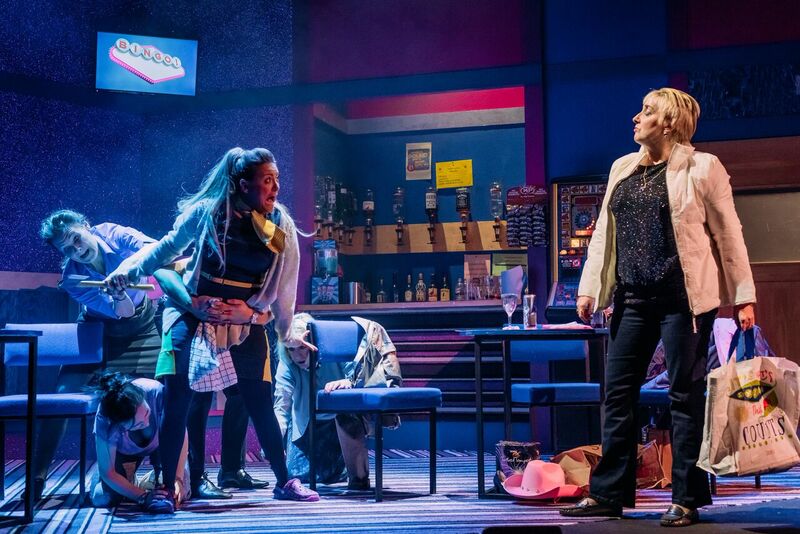 The curving thrust stage at the Assembly Hall is meticulously designed with half a dozen tables and chairs, the Bar complete with spirit dispensers, Fruit machine, walls painted bright blue and glittering pink with matching striped carpet. At the side, the Ladies Loo with two cubicles (one, Out of Order). The show opens with a heartfelt song about a windfall of Lotto cash, wishing that their “worries will disappear .. .. just a couple of hours to get out of debt.” Getting ready for the evening session are Betty, the Caller, and her best gay friend Danny the Barman in their corporate purple uniforms. Betty and Danny (Jane McCarry and Darren Brownlie) in Bingo! First to arrive are Ruth, a new mum, looking dishevelled in casual T shirt and trackie bottoms, and Danielle, a travel agent, in a smart navy dress, her hair piled high with blonde extensions. Sorting themselves out with red wine and Red Bull, they are clearly up for a fun time. Striding purposefully through the double doors comes Mary, bold and brassy from hair to voice, dressed in a sequined top and black trousers. She selects a chair at the central table, drink and lucky mascot to hand, virtually ignoring the two girls – Danielle is in fact her daughter but clearly not on speaking terms. 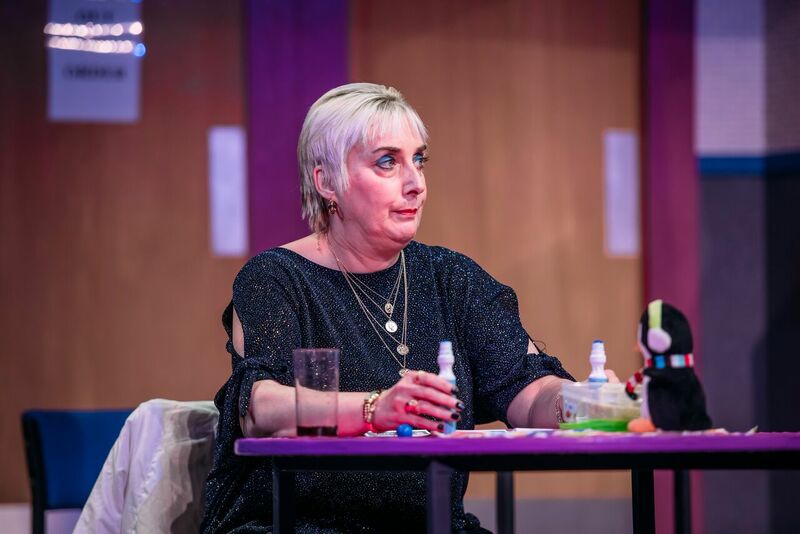 Mary (Wendy Seager) in Bingo! Act 1 kicks off with a series of laugh-out-loud, short, sharp Variety-style character sketches. Jo Freer is brilliant as the frazzled, frantic Ruth describing in graphic detail, the pros and cons of breast feeding. 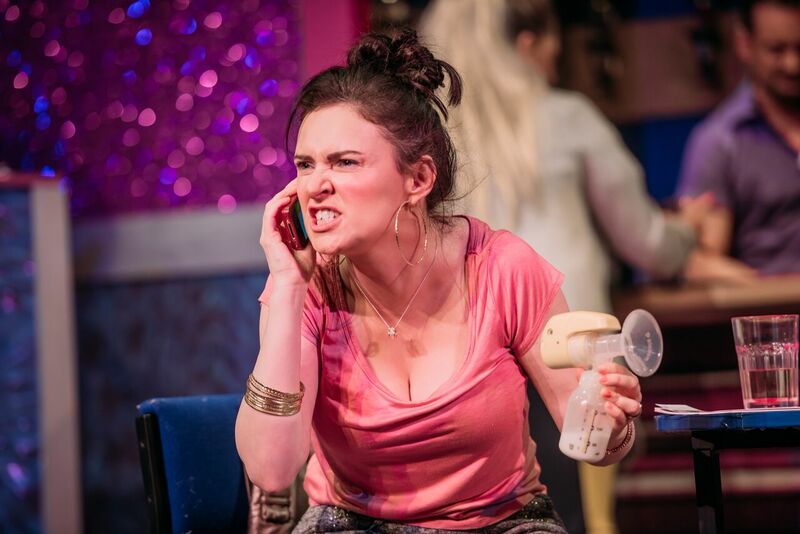 Ruth (Jo Freer) in Bingo! On the phone to Davy, her helpless, hapless partner Davy, she is apoplectic with rage when she hears he can’t find the chicken in the fridge and has fed the baby Nutella. Darren Brownlie as Danny minces around, all swaying hips and cool camp charm, handing out Pink Stetsons to the Gals for Betty’s much anticipated Hen Do trip to Las Vegas. But in the Ladies loo, shamefaced and shaking with guilt, Danielle admits to Ruth that she’s spent their hard earned holiday funds with which she was entrusted. She can only pray that she is Lady Luck tonight. But first a surprise visitor, Joanna, in twin set and pearls carrying a large bag and Henry the Hoover, her prize possessions after being sent packing by her adulterous hubbie. Barbara Rafferty captures her disoriented (and later rather tipsy!) state to a T, as she is welcomed warmly and invited to join in. Danielle and Joanna (Louise McCarthy and Barbara Rafferty) and Henry in Bingo! 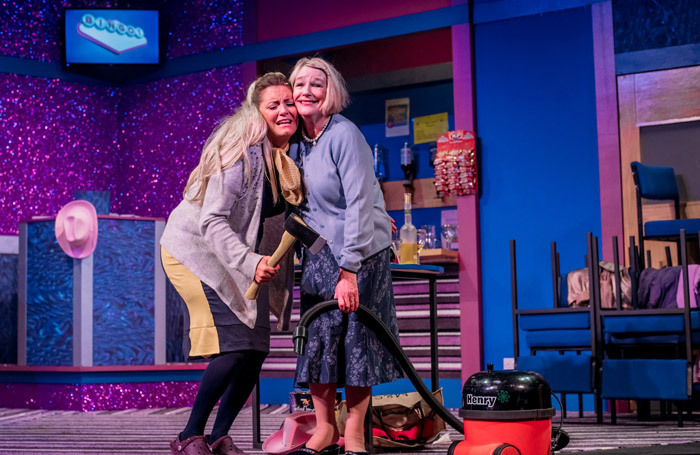 The Game begins as a battle of wits and a flurry of dagger-dabbing pens as bubbly Betty (Jane McCarry) calls the numbers at speed while Mary attacks two Bingo books at once to double the chances. To illustrate the tension, the scene is choreographed in slow motion, with facial gestures and raised hands frozen in time, before they hit the next number with energetic glee. Ruth, Danielle and Joanna in Bingo! Sound effects of chatter and clinking glasses give the realistic impression that a few dozen players are packing out the Club. Danny is bemused at the hysterical ladies, their desperate plight to win, win, win in “ A sea of hope and Primark.” After the comic banter, we are drawn into a surreal and shocking scenario. Talk about Women behaving badly with brutal, bruised results, reminiscent of the macabre tales of “Barney Thomson”, the barber with a scissor-sliced body on his hands. Danielle and Mary in Bingo! Here in the Bingo Club, while a spicy Bloody Mary would have been the perfect cocktail, the shrieked order at the bar is for a double voddy with full fat coke. As the crime drama intensifies each character reveals personal secrets, regrets, hopes and dreams. Louise McCarthy as Danielle neatly portrays her Jekyll and Hyde persona, from cool and confident to a desperate, emotional wreck. A show stopping number in Bingo! Described as a cross between “ Miss Marple & The Steamie,” throw in a blend of River City & Casualty into this musical mash up of Soap Opera, Burlesque and Black Comedy which explodes into a boisterous, far fetched Farce. The narrative could be tightened up to speed up the action with a couple of false, show stopper endings for Act 1. 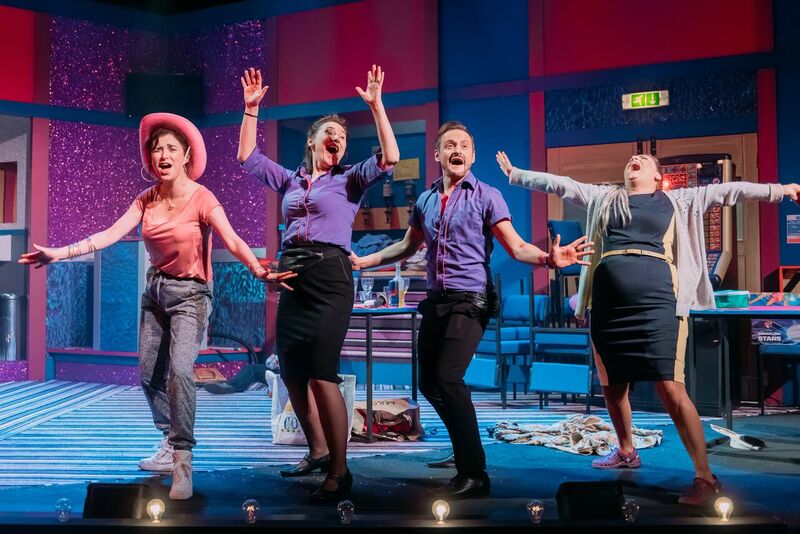 Performed with sparkling energy and astute characterisation, the cast deliver the quick wit, bawdy banter and bittersweet songs with panache and a sharp bite. The focus of Bingo! is not the lingo of Legs Eleven et al, but about the close knit community of players taking part. 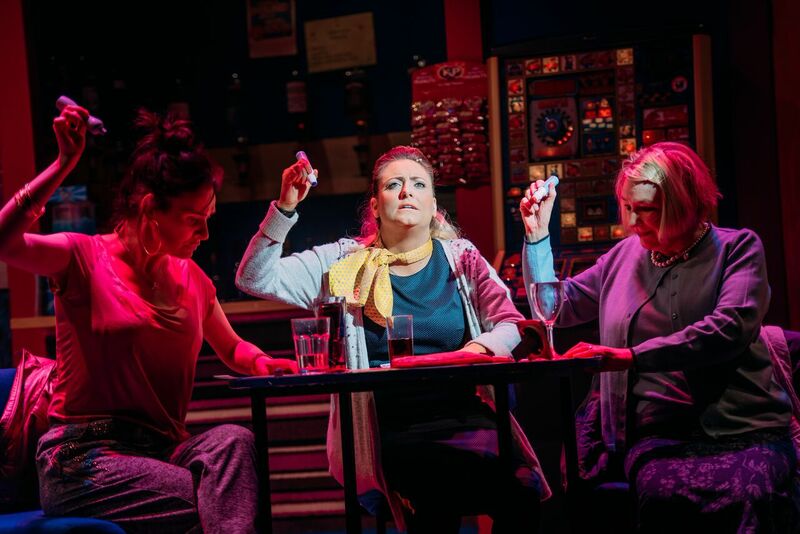 This Bingo Club is about camaraderie, motherhood, friendship, falling out and forgiveness. At a time of personal crisis and despair, loyalty speaks louder than words, with a Spartacus-style generosity of spirit. A good night at the theatre? You bet!